Looking for a smoothie with a little chocolate goodness without any added sugar or sweetener? 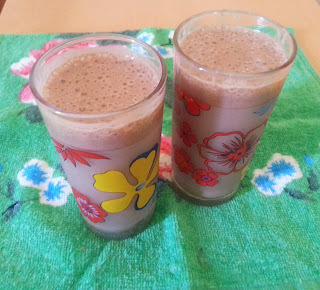 Then try this tasty chocolaty banana smoothie. These are wonderful to have in the morning to get you off to a good start. They can also be enjoyed at anytime during the day.This is a very simple recipe that contains only five ingredients, two steps, and takes only a few minutes to make. 2. Pour into serving glasses or cups and serve. I love chocolate and banana together -- these smoothies look delicious! My children would love this... and my "chocolate allergic" one seems to do a little better with pure cocoa than with pre-made chocolate things from the store. Wonderful combination - banana and chocolate! Oh, man, I wish I liked bananas! I love to make smoothies! I am stopping by from the "Showing Some Love" blog hop. I hope you'll stop by my blog sometime soon too! Thanks! Thank you! I love bananas. I also love smoothies. I will be sure to come by your blog again soon. Yes they are a great smoothie! Hope you and your little Monkey enjoy! Thank you! They sure are yummy! I hope she will enjoy this! I love smoothies! I used to buy them all the time, until I figured I would try making them on my own. Now, I enjoy mixing flavors to come up with different results. Mmmm...I think I'll go make one now! Thank you! I also love smoothies. They are definitely better and more tasty when you make them yourself.